Please join the CityMusic Chorus for a historic performance of Verdi’s Requiem at the Maltz Performing Arts Center on Thursday, May 2nd. This performance opportunity is extended to experienced vocalists in the Northeast Ohio community! Please note that the Requiem will be performed in Latin. 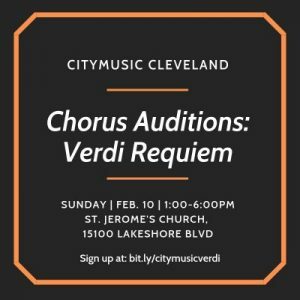 CityMusic Cleveland Chamber Orchestra will be performing Verdi’s Requiem on May 2, 2019 at the Maltz Center for the Performing Arts. Internationally renowned conductor James Gaffigan will lead the performance, and Oberlin alumni Chabrelle Williams and Roy Hage will be among the soloists. Chorus Auditions: Sunday, February 10th from 1:00 – 6:00 p.m.
* Retention excerpt: this will be emailed to each auditionee 24 hours prior to the scheduled audition. Note: Auditions are closed and each person is auditioned individually. Rehearsals will be held every other Sunday afternoon starting in March, full schedule of rehearsals available at the audition.